It's really very hard to find out the best moisturizers or best products that are great for your babies. We are all want to use ones that are safe for our babies delicate skin. My son is 13 months and he tends to have dry skin. For this reason, I always try to keep his skin moisturize. 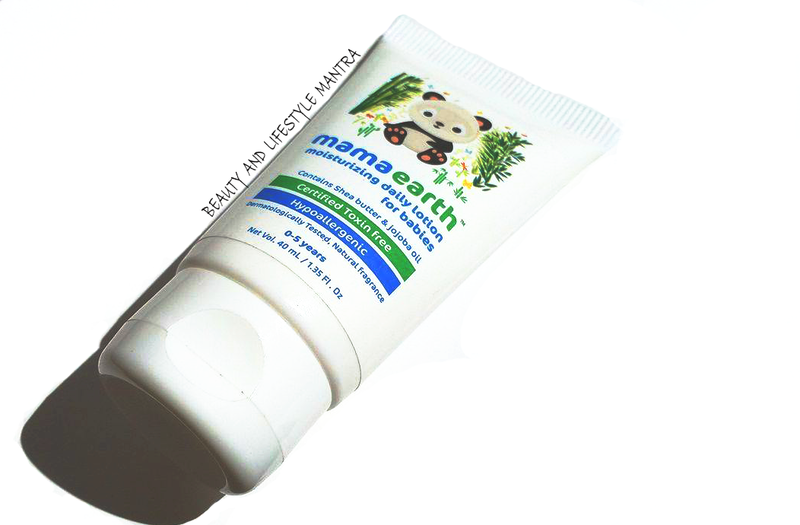 I have been using Mamaearth Moisturizing Daily Lotion for my baby from last one month. That’s been blended with plant-based ingredients to protect dry skin in a gentle way. 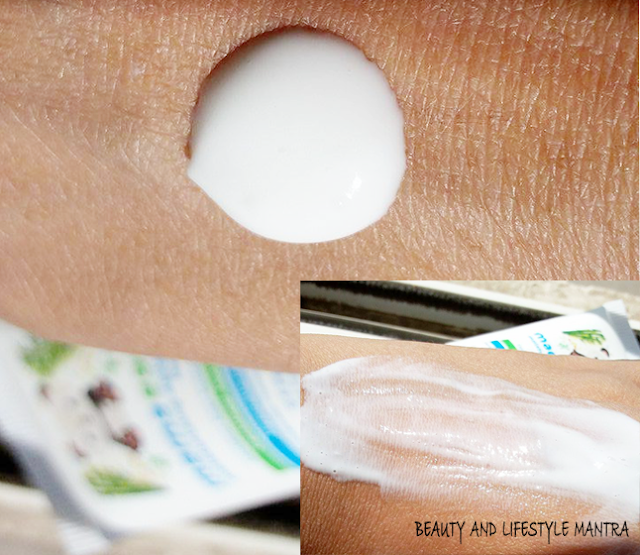 In Today's post, I am sharing my thoughts about this Moisturizing Daily Lotion for Babies. Hi! I am mamaearth’s lotion. I care for your baby’s skin as much as you do. I provide a delicate lightweight blanket of moisture made of 100% plant-based ingredients like Shea butter, Aloe, Vitamin E and Jojoba oil. I protect from dryness and irritation and let your baby feel fresh and velvety soft. Now isn’t that what love is all about. Purified Water, Caprylic Capric Tri Glyceride, Wheatgerm Oil, Olive Oil, Cocoa butter, Shea Butter, Jojoba Oil, Glyceryl Stearate, Sorbitan Olivate, Tocopheryl Acetate, Calendula Extract, Aloe Vera Extract, Sodium Benzoate Synthetic, Potassium Sorbate, Cetyl Alcohol, Chamomile Essential Oil. The texture of the daily lotion is silky smooth. It has a medium consistency. The lotion is very light-weight and white in color. I absolutely love the scent! It has a nice herbal fragrance from various active natural ingredients and the fragrance lingers on for an hour or so after the application. I have used this lotion for my baby every day just after the shower and at night time. 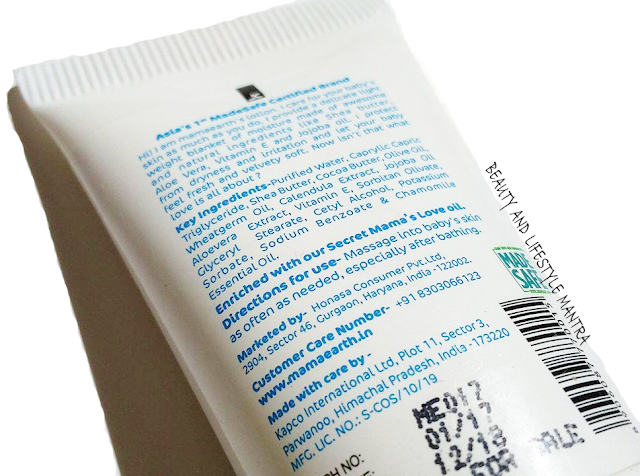 This lotion is not greasy and it gets absorbed into the skin very quickly without any oily or sticky feelings. I pour some lotion on my palms and gently massage it into my baby's skin. It spreads well on the skin and immediately leaving a nice mild refreshing scent. This Moisturizing Daily Lotion is so gentle and soothing that it’s suitable for babies from o to 5 years old. One thing I really like in particular about Mamaearth Moisturizing Daily Lotion is that it has a refreshing and cooling effect during application and leaves my son’s skin moisturized and looking healthy right away. Overall, This lotion is silky smooth, very light-weight, smells amazing, sinks into the skin quickly, and moisturizes. 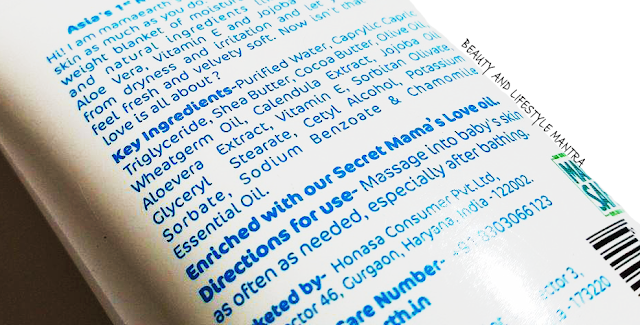 It makes your baby's skin soft & supple. I don't think there needs to be any improving because it does everything that I want it to do! 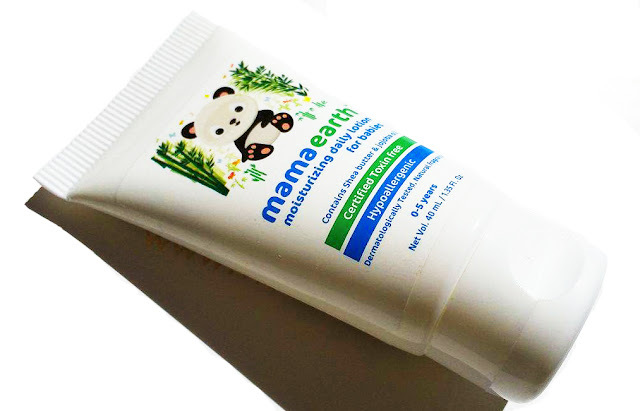 If you are looking for a moisturizing lotion that really works and that will help relieve your little one’s dry, itchy skin then I suggest trying Mamaearth Moisturizing Daily Lotion. Such an amazing product! P.S Before using any products for my baby, I usually to do a patch test, apply some product to a small area of skin on his arm or leg. Wait for 24 hours to see if he has a reaction. If your baby's skin reacts, it will become red, itchy, sore or flaky. Other the products will safe for your baby.